The Harvard Gazette reports Harvard scientists have figured out how to make robots made completely out of soft materials - with even their core logic embedded in rubber, rather than microchips. They're relatively simple for now, but the researchers are looking at future applications that go beyond creating rubber octopuses that could crawl across a desert, as cool as that might be: Read more. Robot car stops to ponder how to get into MIT. Xconomy reports that Nutonomy, which is testing robocars in Boston, has run into a problem in that the rolling Marvins can't figure out what to do at stop lights when there's solar glare that makes it hard to see just which color the signal is. Read more. M .Mantis stayed a respectful distance from Marty the robot at the Stop & Shop on Newport Avenue in Quincy tonight. 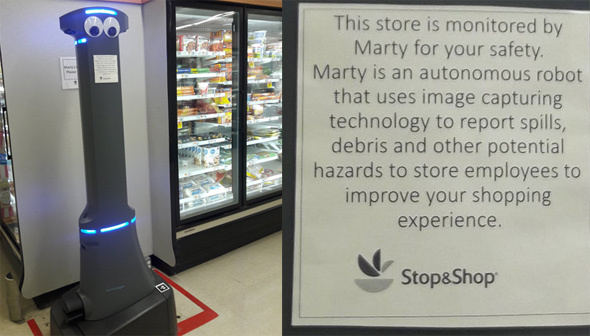 As you can see from the sign, Marty's stated purpose is to spot spills and fallen signs and report them to store workers. Read more. 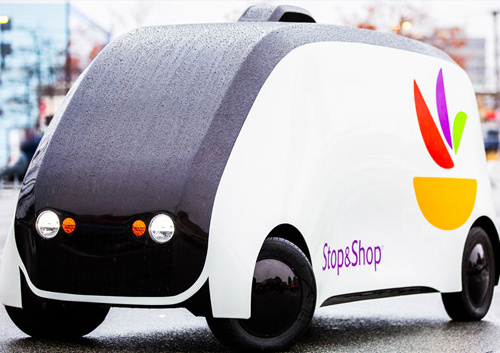 Robomart, a San Francisco company, says Stop & Shop will roll out its robogrocery vehicles in the Boston area later this year. Read more. For the past couple of days, somebody has been sending vast amounts of "malicious" e-mail to people with MIT e-mail accounts, bringing the system to its knees as the school tries to block the problem. Read more. Researchers at MIT have developed a small plane that uses ions to fly: Read more. The T has canceled the E Line past Brigham Circle due to a trolley and a stopped box truck exchanging some love pats near the Riverway and is advising riders to jump on the 39 bus instead - but the buses are having their own problems due to all the traffic piled up as a result. Sure, Boston Dynamics's jumping, cinderblock-flinging would-be metal assassins get all the attention, but in a distant part of Charlestown, another company is quietly designing genial robotic luggage that follows you like a puppy while carrying up to 40 pounds of your stuff, the Charlestown Patriot-Bridge reports. MIT takes us on a tour of its nuclear reactor, conveniently located just off Mass. Ave. The Boston Public Library said today it's making hotspot kits - which will let borrowers share an Internet connection with up to 15 other users - available for 21-day loans at all of its branches and the central library in Copley Square. The devices connect to T-Mobile's Boston network. Anybody with a BPL card can borrow one of the gizmos. Two developers are telling the BPDA they will shortly file detailed plans to create an biotech and life-sciences R&D park on either side of Western Avenue, at the edge of Harvard's vast Allston holdings, where the university is planning its own large R&D development. Read more. A federal jury today convicted Martin Gottesfeld, 32, on one count of conspiracy to damage protected computers and one count of damaging protected computers for distributed denial-of-service attacks that disrupted the entire Longwood Medical Area and a Framingham residential youth treatment program. Read more. Archtect's rendering of the building interior. 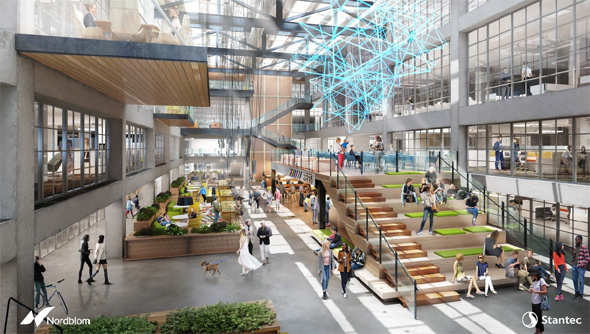 The Board of Appeals yesterday approved most of what developers asked for so they can turn the old Boston Globe plant on Morrissey Boulevard in Dorchester into a new office, research and manufacturing space aimed at high-tech companies. Read more. Boston today gave a company experimenting with driverless cars permission to expand its testing from the Seaport to the entire city. Don't worry, at least during testing, you'll still have somebody to stare down behind the wheel: Read more. BostInno reports on the opening of the Kessel Run Experimentation Lab near North Station. It's a military "start-up" aimed at shortening the time it takes to build software to help run planes and stuff, and hopes to ramp up to 300 employees. Boston Police report arresting an 18-year-old for a knifepoint robbery on Strathmore Road last night after they pinged the victim's phone to the alleged robber's home a few blocks away in Brookline. Read more.